Respiratory protection equipment devices are essential PPE for people working in hostile environments. There is a large range of various specific equipment for any situation (air purifying or air supplying respirators). Proper questions are to be answered in order to select the proper respiratory protection. FOR WHICH APPLICATION OR OPERATION? Respiratory protection equipment devices are gathered into several categories according to their properties in order to better respond to different situations. Thus the context of use is the first step in selecting a respirator. Classic standard masks are made for work applications only. They enable people to enter areas with known and quantified hazard. The second question to answer is about the location. Confined spaces are poorly ventilated areas with huge risks for workers are they contain barely any oxygen. A location without – or almost without – oxygen implies very important risks of suffocation. A self-contained breathing apparatus must be selected for this kind of environment as it provides an air supply with an oxygen rate of 20,9%. For well ventilated areas or outdoor applications, an air purifying respirator can efficiently protect the breathing tracts depending on present pollutant concentrations. Depending on present gas or substance and/or duration of work, a half-mask, a full face mask or a powered air purifying respirator must be selected. WHAT IS THE OXYGEN RATE? Oxygen rate is arguably the most important factor when selecting respiratory protective equipment. Air purifying respirators are efficient as oxygen rate is strictly above 19% volume. As their name implies, they feature purifying filters but provide no oxygen. The danger becomes serious for workers evolving in environments where the oxygen rate goes under 19%. It is then required to wear a supplied air respirator. This device uses an air compressor or breathable air cylinders and provides clean air with 20,9% of oxygen. FOR WHAT KIND OF POLLUTANT? Once the application is clearly defined and oxygen rate monitored, the pollutant nature shall be taken into account. This element is important when selecting a respiratory protective unit – mainly for the filter choice. If the pollutant nature is unknown, using an air purifying respirator is prohibited. As the filter selection would not be relevant, it is recommended to wear a self-contained device. For solid and liquid particles (lead, asbestos, ceramic fibers, aerosol), radioactive and highly toxic particles, bacteria and viruses (bird flu, A/H1N1 flue, SRAS, tuberculosis, Ebola virus), it’s better to use a particle filter (P letter) – preferably level 3 (P3) – with a 99,97% substance filtration. Gas filters are gathered into several categories labeled with a letter (A, B, E, K and Hg). However, some gases and vapors are irritant to eyes (like chlorine). In this case, half-masks should not be used as they don’t provide sufficient protection or should be combined to an eyes protection. WHAT IS THE POLLUTANT CONCENTRATION? Knowing the pollutant concentration is essential when selecting a respiratory protection. The maximum allowable concentration is set by its OEL (occupational exposure limit). If a pollutant can be filtered, using an air purifying respirator will safely protect the breathing tracts. When the concentration is below 30 times the OEL, a gas mask is enough. 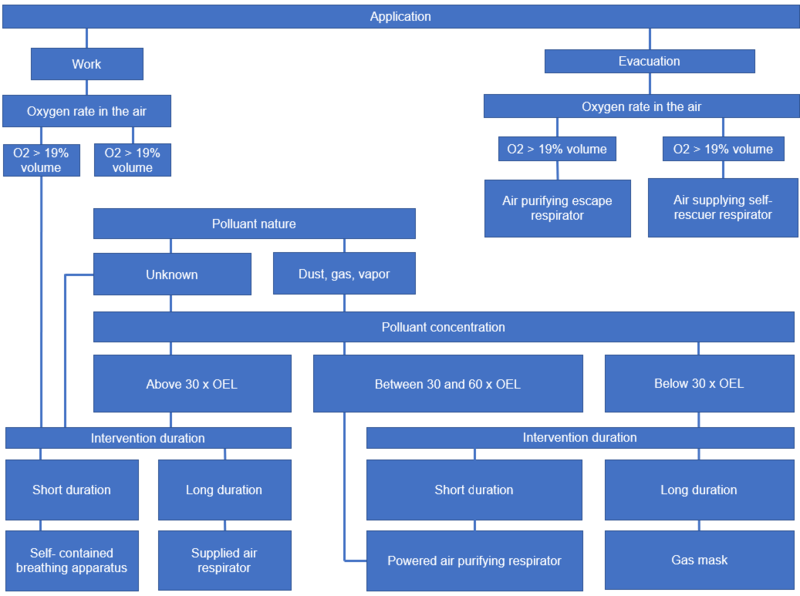 If the pollutant concentration in the air is monitored between 30 and 60 times the OEL, a powered air purifying respirator should be selected. These devices generate a slight overpressure into the face piece. As a consequence, the pollutant cannot enter the air purifying mask or hood. If the pollutant concentration is above 60 times the OEL, filters are ineffective because its breakthrough time will come too fast. Air is not breathable anymore and an external air supply needs to be selected: a self-contained breathing apparatus or a supplied air respirator. If the concentration in unknown, it is recommended to use a self-contained breathing apparatus. The last question to answer is about the work environment, duration and physical effort. Labor regulations indeed recommend the use of a powered air purifying respirator for works exceeding one hour. Thanks to their positive pressure system (air injected into a hood or a mask via an engine), powered air purifying respirators provide comfort and safety and are well-suited for long duration work and demanding situations. On the opposite, using a negative pressure gas mask – with breathing effort from the user – is enough for interventions that last less than an hour. This question is also to be asked for selecting an air supplying respiratory protection or SCBA. Self-contained breathing apparatus shall be preferred for short interventions because of the compressed air cylinder weight and the volume of breathable air. For long duration works, an air supply system will provide a theoretically unlimited quantity of breathable air for almost no weight.